September 12 Terena Castro participated in a panel with Torgny Östling on natural resources and the relationship between city and countryside at the September the movement meeting in Stockholm arranged by FoE Sweden, Association Aktivism.info and others. 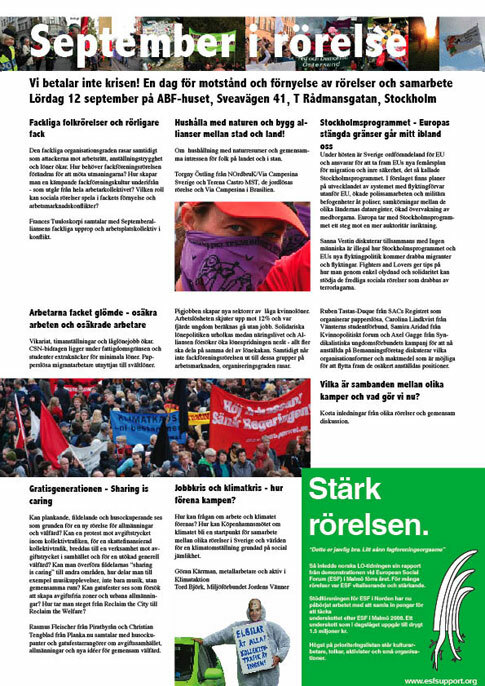 Via Campesina in Brazil and Sweden are very similar in that they both are involved in agriculture and forestry. By contrast, the difference in size is very big. In Brazil, several organizations are members of Via Campesina with in total more than 2 million members, in NordbruK, fewer than a hundred farmers. But the description of the problems of managing natural resources in both Brazil and Sweden are much the same. Torgny described how agriculture and forestry in Sweden became impoverished by domestic colonization policies for one hundred years ago. Thus the farmers in the Northern half of Sweden lost much of their influence and lost their forests to corporations. Today the same process accelerates through the capital liberalization directive. This EU Directive was accepted with a broad consent in 1993 as part of Sweden’s preparations for becoming member of EMU and EU with the support of all parliamentary parties. It was a deregulation of all previous demands that those owning agricultural land or forests should have competence in agriculture and forestry. It also eliminated the earlier possibilities for farmers to influence the price, logging practices and to avoid constructing forest industry when there was not enough forest. Land ownership became a a market for speculation and the peasants were marginalised while the corporation could grab maximum profit out of the new conditions. This aggressive opportunity for the Swedish forest company strengthened its capacity mainly together with Finnish forest companies to take the lead in the world in launching large-scale monoculture plantations and destruction on a global scale. For Terena, but also for the seminar participants the description of the Swedish situation was new, while many participants were partially familiar with the situation in Brazil. The conclusion of the seminar was that there is not enough to combat the Swedish-Finnish forestry company Stora Enso in Brasil. It is equally important or more important to also fight for a forest in the Nordic countries to promote biodiversity and power over forestry for the rural population instead of remote destruction organised from corporate offices in big cities. In the following discussions between Torgny and Terena it became clear that NOrdrbuK has a special role in the Via Campesina. In the rest of Europe the peasants have mostly experience of farming and coal mining as a problem. In Sweden forestry has been a conflict issue creating the experience for a long time. NOrdruK sits in an EU group in Brussels for forest issues and has long-standing experience to pursue this issue. That is what both the Via Campesina Europe and Via Campesina international needs. It is important for the Via Campesina in countries affected by Nordic forestry companies to get allies to combat these forest companies on their home ground. It is rarely this insight is expressed. Torgny pointed out that it is only Friends of the Earth Sweden, which has put Via Campesina Sweden and Via Campesina Brazil, in the same panel to discuss common issues. The political, social and economical connection is rarely expressed. The focus is rather directed against morally emberassing conditions in the South while the need to change policy and also the development model in Sweden are missing out. The following discussion also came up with some criticism of the Via Campesina’s guidelines for climate change talks in Copenhagen. The guidelines said that agriculture has become the central issue. This can be questioned. It is rather the issue of forest natural resources issues. It would be useful if Via Campesina’s position will be improved on this point. Terena is going to take comments back to the Via Campesina in Brazil on how to act at the Climate Summit in Copenhagen. This is essential for us in the Friends of the Earth Sweden and oru sister organisations world wide. Via Campesina in Brazil has a key role in the Via Campesina International and the Friend sof the Earth International sees Via Campesina as its major cooperation partner. After the discussions in Stockholm seminars and a demonstration in Växjö followed. On Sunday the People’s Movement No to the EU (FNEU) organised a seminar where Småbrukarna (Small farmers) chairman Åke Carlsson and FNEU’s chairman Jan-Erik Gustavsson talked about the EU’s agricultural policy. Ake was skeptical about the prospects for political change and saw consumer power as a viable approach. Conservatives in Swedish parliament have supported change of regulations to enable farmers to slaughter their cattle at their farms and dairy production to the benefit of farmers and consumers. The interest in organic and locally produced food increases and fairs for interested attracts thousands. I attended the seminar for FoE Sweden and talked about the climate summit and the link with agriculture and forestry. Terena would attend the next day at a seminar organized by Small farmers. A demonstration on Sunday against GMO gathered nearly a hundred people. Speakers were Rune Lanestrand from Small farmers, a Dutch slow food chef from neigbouring Göinge, a beekeeper, Greenpeace, Green Party, Center Party, Women and more. The audience cheered in the rain with placards and shouting. After Växjö Terena continous her tour to Malmö and Copenhagen. In Copenhagen she will meet the Climate Forum 09 which organizes a counter summit all through COP15 7-18/12 and International Forum cafe. 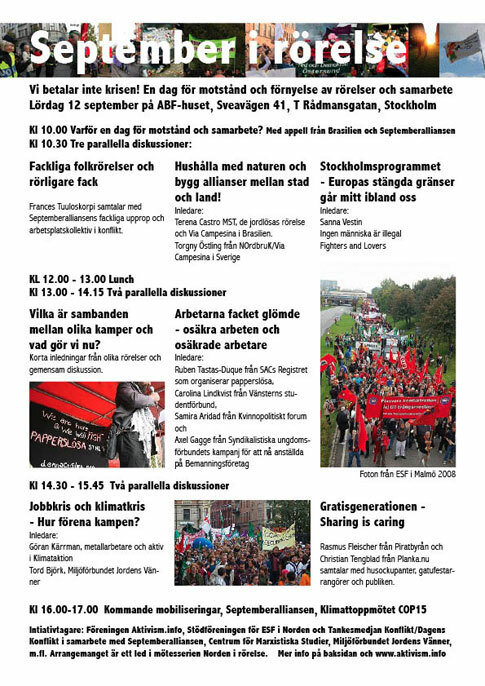 In Malmö there will be several meetings ending with Moving the World at Kvarnby People’s High School on Sunday 20/9. PS. Terena Castro also had a meeting with the December 12 initiative that organizes a big demonstration on this date in Copenhagen.